Our goal for this site is to take a step forward by connecting our customers to our professionals and soldering experts. We are interested in what you have to say about our products, soldering techniques or any work needs that might arise. We would appreciate hearing your comments to be able to meet your expectations in soldering. Listening to what you have to say is important as well as keeping you informed. So information about new products, company events or soldering articles will be posted in this blog in different formats: text, pictures, graphics, videos and many more. We sincerely hope our customers and professionals will feel free to express their opinions. This is the best way to share a quality feedback and learn about trends in the sector. Just think of this site as a place to share our passion for soldering. 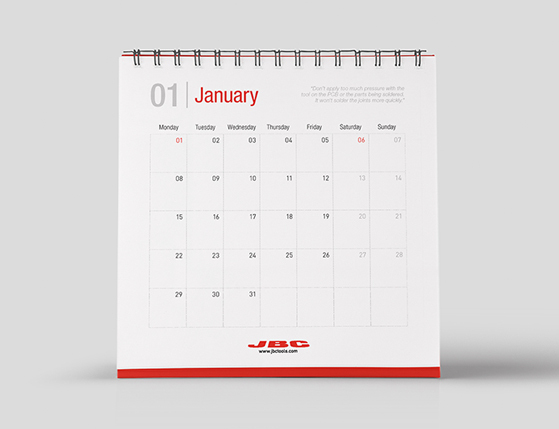 We will keep you up to date on the latest developments from JBC, the company you can trust in. Thanks again for choosing JBC for your soldering and rework. We from http://www.macrepair.nl do a lot of soldering on Apple products and we have tried many tools. We found the JBC CD-2D the best hand soldering tool. Thanks. Thank you Andries for your kind words. We are pleased to hear that you like our tools and we hope to continue providing you with the best service in the future. I’ve often made my own soldering gun tips out of a sulabtie length of #12 copper wire (like houses are wired with). I’ve heard people say this will ruin a soldering gun, or not work for some reason, and all I can say is, this has never failed me, and they are always cheap and readily available. I read this tip in an electronics magazine 40 years ago, and have never bought a factory tip since.